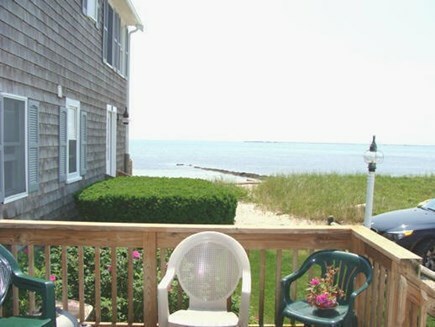 Spend your Cape Cod stay oceanside! 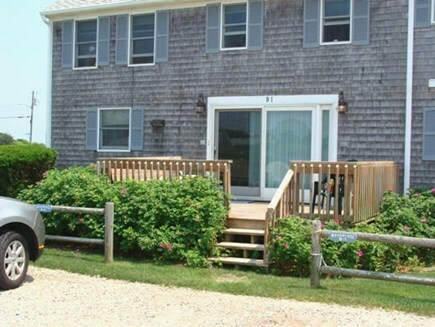 This beachfront 2 BR, 1.5 BA Hyannis condo offers ocean views from almost every room. Kalmus Beach, the place to watch windsurfers, is steps away – where you can watch action from the comfort of an open living room. An ideal location for your day trips to Nantucket and Martha's Vineyard, the Hy-Line ferry to both islands is a short walk or Uber way. 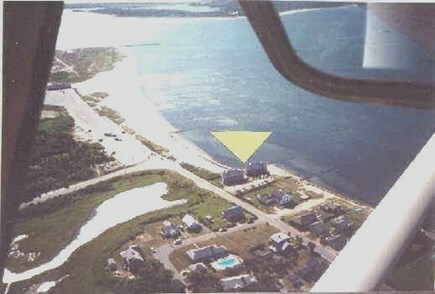 Ocean views surround you the moment you park! Two parking spaces- one for you and one for your guest. A glass door leads you into the living room with seating for 5, furnished with 2 floral chairs, 1 wicker chair, a pinstriped queen-size sleeper sofa, and charming nautical accents. Hardwood floors shine in this room, a gas fireplace warms the air, and a 32” flat-screen TV offers Xfinity. Just past the living room is the dining area, where there's seating for 6 at a wood and tile table. Glass sliding doors open to the deck, where you can enjoy ocean breezes and additional seating. Find the fully stocked kitchen back inside. There you'll find an electric stove/oven, Formica counters, a double stainless sink, dishwasher, with pale tile back splash. From stemware to flatware to pots and pans, this quaint and bright kitchen has everything you need for preparing special dinners and beach snacks. Find a half bath on the way to the remarkable master bedroom, located to the right of the living room. White Berber carpets are underfoot, and you can watch the waves from the comfort of the king-size bed. The spacious shared bath features a stand-up shower, single sink vanity, and plenty of light. The second bedroom features a queen-size bed and with ocean views. The laundry facilities are conveniently located in the hallway next to the bathroom. 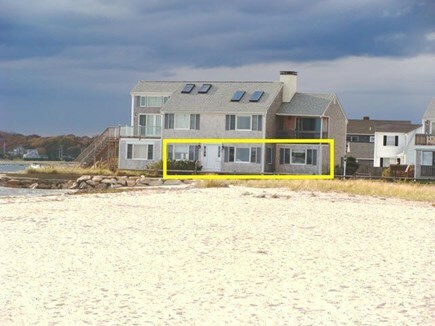 If you love the beach, this Hyannis condo is your happy place. 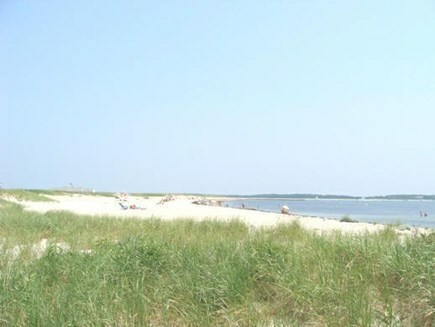 Walk onto the association's private beach in seconds, and find Kalmus Beach just steps away. Pack a picnic and spend an afternoon splashing in the waves and watching the windsurfers jump and spin. Additional pricing info: Ask about off season and multiple week discounts, State and local taxes of 14.45% will apply.